These cool finished basement ideas share a variety of exciting ways you can get the most out of your extra living space. 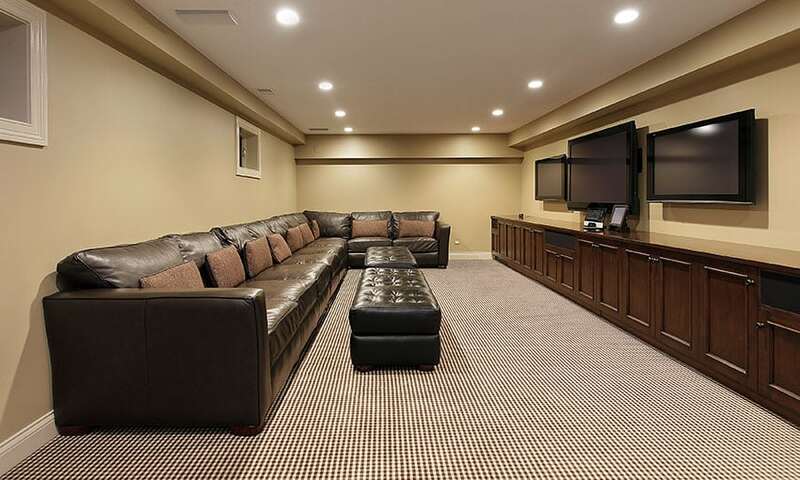 A finished basement design gives you, family and friends a place to hang out and enjoy any time of year. 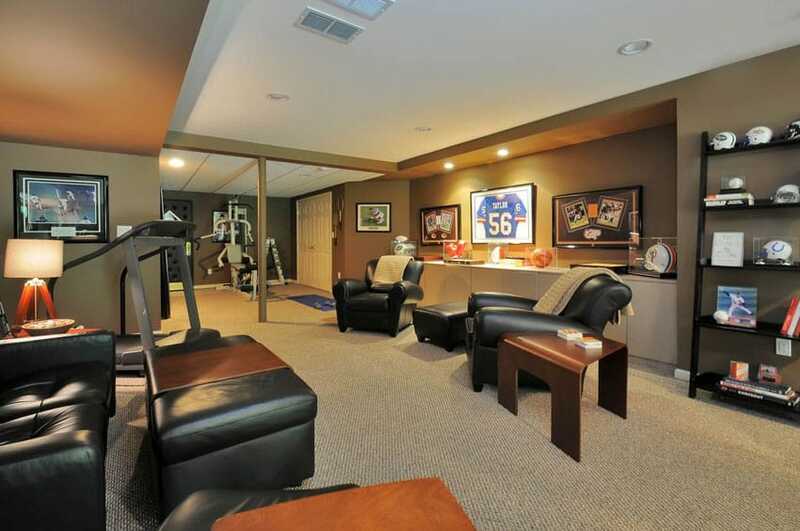 From home bars, game rooms, home gyms or movie rooms there are tons of ways to create a finished basement you’ll love. In modern homes, game room are starting to become an essential part of the house. 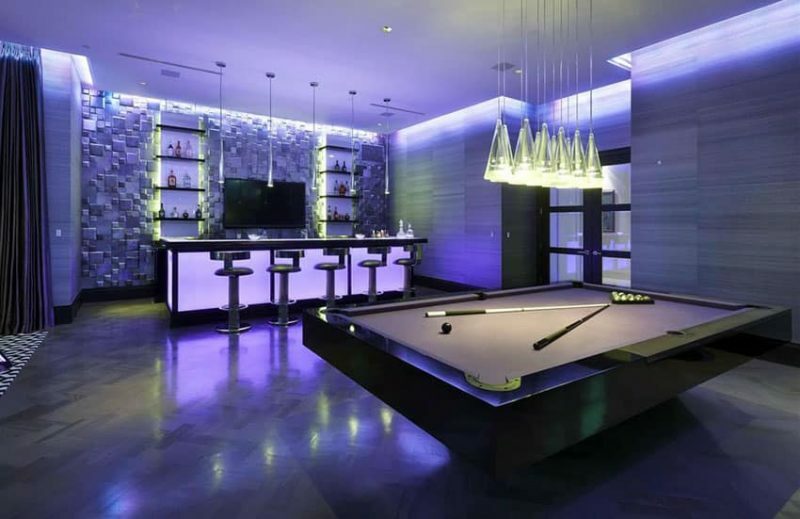 The modern basement game room shown in the image above with mood lighting make this area look just like a high end nightclub. Gorgeous cone pendant lights over the pool table are ideal for a focused lighting which are perfect for the game. A stylish hideout for the man of the house and his friends. By definition, the Basement is the lowest habitable level of a building or a residential house which is usually below ground level. Thanks to interior designers, these basements are now being transformed and remodeled from a dark, damp and dreary place of the house into a functional living spaces which can be enjoyed by the whole family. The size of the basement doesn’t matter – whether it is a full basement, half, walkout or cellar type. Basement remodeling could enhance the value of the home since it expands the square footage of the house, thus creating an additional, usable space and efficient storage when renovated. A finished basement can also be a good investment. It is very important to first think about how you want your basement to function. • Open Floor Plan – allows you to incorporate several smaller working areas and different zones for various activities in one well-designed space. • Stairwell – it is best to open the stairwell and install a banister for a more open feel. Another idea is to incorporate storage space with the stairs. • Flooring – it is very important to select suitable flooring which will be durable and appropriate for all types of weather and withstand fluctuations in moisture levels. • Lighting – create well-lighted basement using track lighting, recessed lighting as well as incorporating other types of lighting fixtures for more dramatic effect. Allowing natural light into the basement is a big challenge; and the best solution is installing window wells. Make sure you install window wells where you could make them as wide and deep as possible to bring much needed sunlight into the basement. • Colors – when renovating or remodeling basements, note that colors do play an important role in each design concept you want to achieve. Choosing the right colors will make your basement stand out and create a cozy ambiance. • Sound Proofing – noise from the basement can travel up to the main house, it is advisable to choose an engineered drywall to dampen the noise coming from the basement. 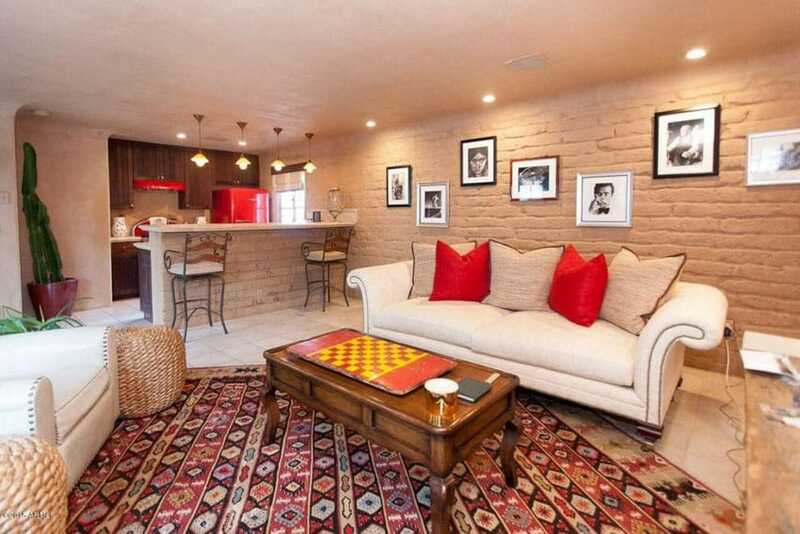 Find inspiration for your basement makeover with our featured design and decorating ideas. Below are concepts and popular choices for different functions and activities for a basement renovation. A neutral color palette is employed for this modern basement which incorporates a small kitchen, bar and a living area with fireplace. The result is a lovely and relaxed feel for this open floor plan multi-purpose room. The porcelain faux wood flooring and the area rug adds texture and splash of color to the room. For homeowners who love to entertain a basement can be transformed into a home theater or entertainment area. This can be a good reason to go downstairs and gather together with family and friends. Every home needs extra storage space and the basement is usually the perfect area to accommodate additional storage. Built-in shelving and cabinets which are incorporated with the stairs is a practical way of displaying personal items and providing extra storage space. 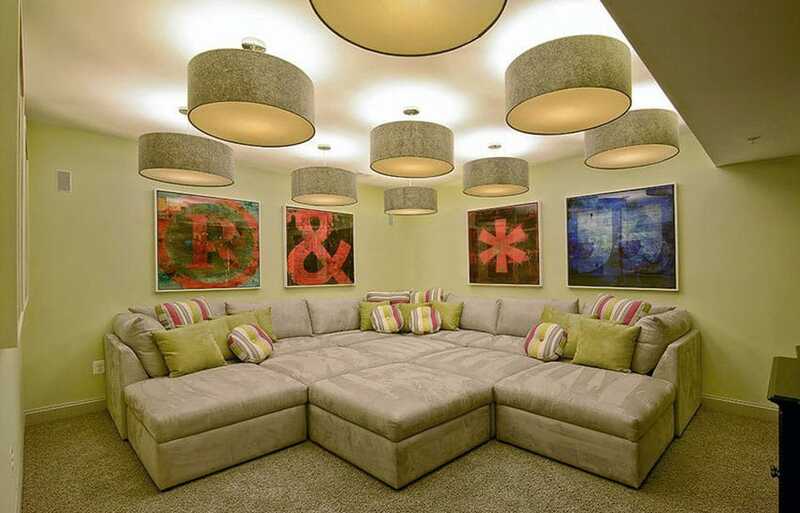 This design idea can be an interesting feature for your basement. For wine lovers, the basement space can be the perfect place to create a wine cellar for storing wine bottles with style. The basement can also be a great way to add a multi-activity space for the kids and incorporating a home gym or a home office; so that parents can be with their kids working out or while finishing paper works. 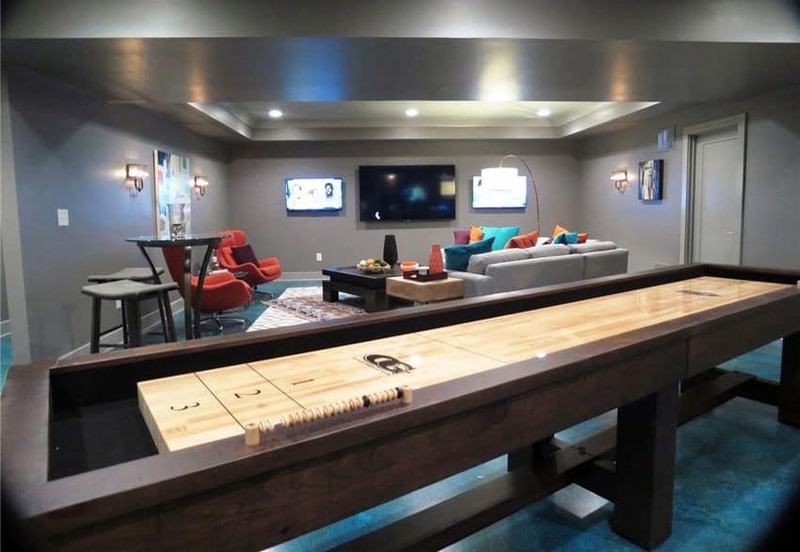 Another popular option to make the most out of a basement is to design a space for the man of the house by creating his own “man cave” featuring a game room or home bar. The woman of the house can also have her place too for a hobby room – by transforming the basement into her own art studio. Whether it may be a sewing room, pottery room or painting room; the basement is a perfect place for her to hone her craft. Looking for an additional area to relax, unwind and be pampered? The basement could be a perfect place to design a home spa, sauna or your own salon. Book worms can have a nice and quiet space tucked away in the basement. Transform your basement into a library and making use of the walls by installing open shelving for books and creating a cozy sitting area for reading. Need that extra privacy for guests? The basement is the ideal place to create a cozy and stylish bedroom for family or guests as well. Create a basement laundry room where you could enjoy doing the chore and at the same time can double as valuable storage space. Basement spaces have abundant remodeling ideas and design possibilities that would cater any purposes and activities. Our gallery of cool basement design ideas will surely impress and excite you to create your own basement living space where everyone will love to hang out. 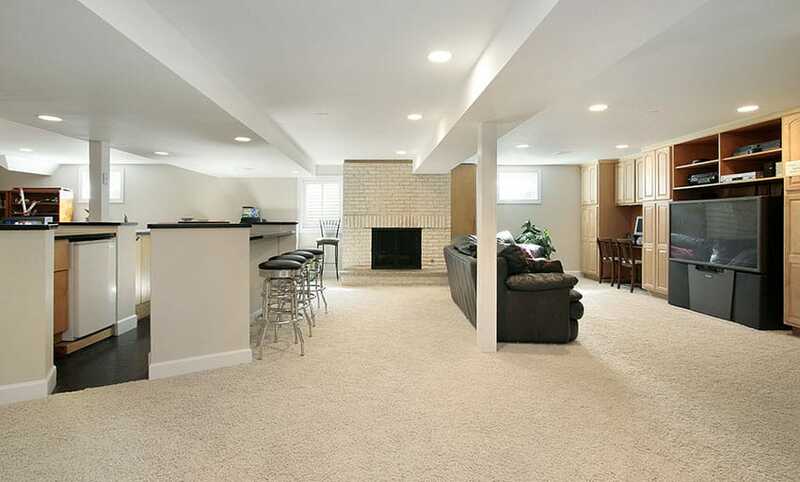 This luxury basement with a wet bar offers extra convenience and accessible utility to this lower level living space. Wall to wall cabinetry with open glass shelving provides a display storage for wines and other liquors. Raised panel base cabinets give lots of additional storage space. The stone fireplace keeps this basement warm and cozy; perfect for entertaining and a great focal point for the area. The stone flooring and matching stone accents on walls and island bar are crafted to create the right balance for this design scheme. Whether your basement is for a game room, man cave, yoga retreat, or movie room, this room has the potential to be the best room in the house. What color you chose depends on a few things, the most important being what is the tone that you want to set for the room? Followed closely by how the room will be used and who will be using it most. The color is really going to set the stage for this space so you want to make sure you have the right color before you commit it to your walls. Before you even consider color, you want to have lighting in the space figured out. If you don’t have any natural light, how are you going to brighten up the space? Will you use pot lights or track lighting, will you supplement with floor and table lamps? Your paint will look worlds different if you change your lighting after you paint, so try to sort out your lighting needs first. 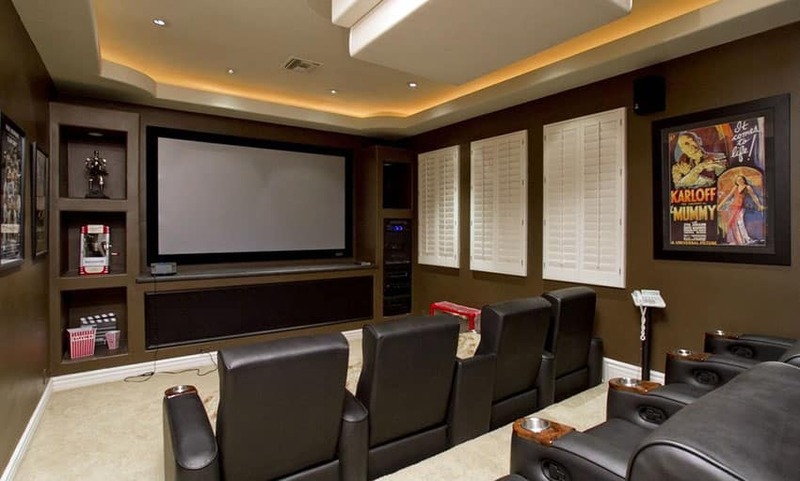 If you are going for a movie screening room, then go with a dark neutral, or simply go dark. You want the walls to recede and you don’t want a lot of glare from your projection equipment or tv. Make sure to use a flat paint and paint the ceiling in a dark neutral to prevent light from bouncing around and creating glares. For a classic, old world move theater feeling, go with a rich burgundy or deep navy. If you want a more contemporary feel, a gunmetal grey or lighter silvery grey would be perfect. Bold, dark colors aren’t the only choice though, if you aren’t a fan of saturated color, simply chose a dark neutral in tones of grey or brown. For a playroom, keep it cheerful and bright. A lovely lemon-curd yellow is a great choice provided you have ample lighting. Any yellow tone will look muddy in a dimply lit room, so keep that in mind when selecting paint colors. If you want to be really adventurous, purple is perfect for a basement playroom. Purple inspires creativity and energy and is great for the playroom that will double as a creative space. If serenity is what you are after, think watery blues with undertones of green. Blue can read differently in different light levels, what looks relaxing on the sample strip can look downright neon covering an entire wall, choosing a blue with green undertones will help prevent that electric blue look. These beautiful, watery colors will make your basement guest room feel light and airy. It will also provide a relaxing, outdoors vibe to a yoga or meditation retreat. Finally, go bold. If you are going to be using your basement as a sports hangout on game day, why not paint at least one wall your favorite teams color? 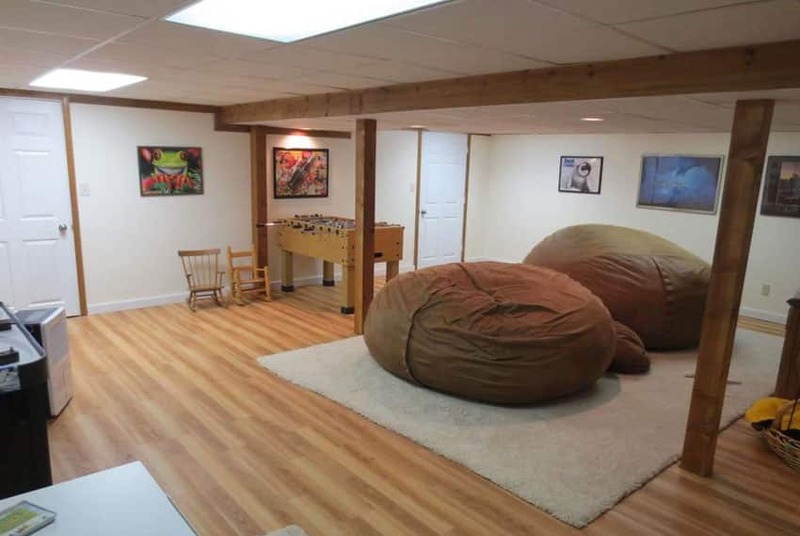 Yes, it is outrageous, but your basement is your playground, don’t be afraid to be bold and go a little crazy. There are no hard and fast rules about wall color in a basement, but there are ways to make your color look it’s best in a space that often has no natural light. Ensure that your lighting is in place and adequate before deciding on a color, determine what the space will be used for, and consider the tone that you want to set for the space. Your basement is one of the few truly personal spaces in a home, make it yours! A traditional rustic basement family room features period details such as leather furniture, solid wooden chest used as side table, custom made display cabinet and paneled accent wall. Dark brown wood ceiling beam with mood lighting, conceals plumbing and highlights the wood panel ceiling which adds texture and character to the space. 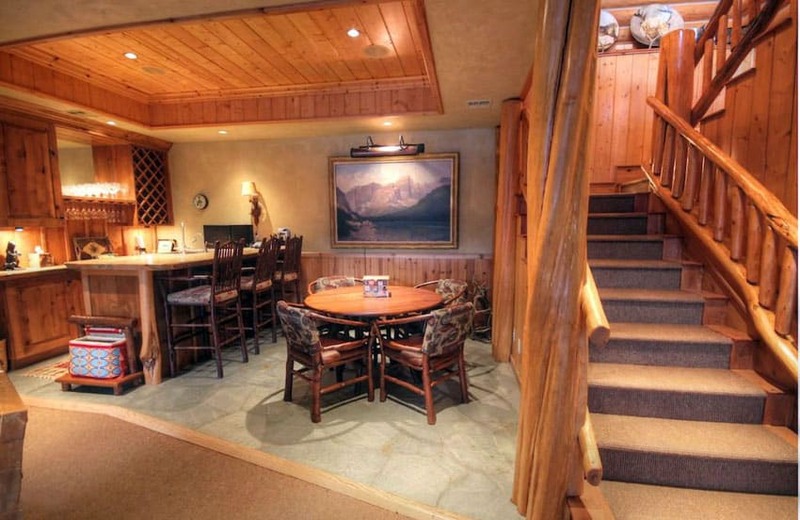 This cozy and warm retreat is perfect for relaxation and suitable for any family gatherings. 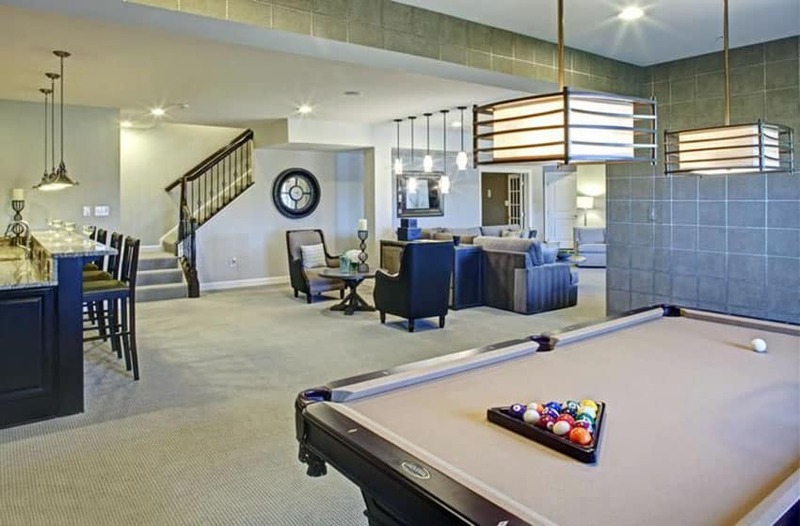 This contemporary basement design has several entertainment areas such as pool game area, granite home bar and more than a few seating areas are perfect for accommodating different interests and activities giving this game room personal charm and style. Modern drop lights combined with recessed lighting provides ample illumination to the whole area. 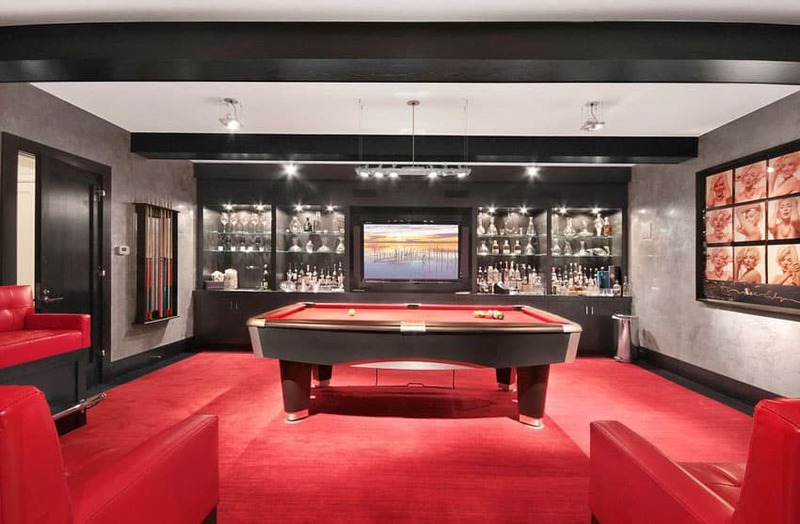 Red and Black color scheme makes this luxurious man cave basement very stylish. Wall to wall custom made cabinetry features an elegant display glass shelves for glassware and liquors. The open space in the middle is perfect for the widescreen TV; while the cabinets below provides that extra needed storage. Who said that red carpet is just for runways, this red pool table and seating lounge is a unique choice of color which is matched by the red-carpet flooring. Neutral light tone textured gray walls balances the splash of colors. Transform your basement into a multi-activity area dedicated to have loads of fun. Oversized bean bag seats for relaxing, reading books or just a space for adults to spend quality time with the kids and keeping an eye on them while they are playing. Create a space for children’s games and toys by having a foos ball table and some miniature rocking chairs. Light tone laminated wood flooring is a good choice for this basement play area. Make use of existing materials such as this basement stone wall; and add accent by hanging artworks and photographs of those treasured memories. Neutral and earth tone colors combined with comfortable sofa, cozy furnishings make this family basement a warm and inviting space. A small kitchen and wet bar makes entertaining convenient and much fun. A focal point wall is a great way to build architectural interest in the basement by installing brick tiles for durable and easy-to-maintain walls. 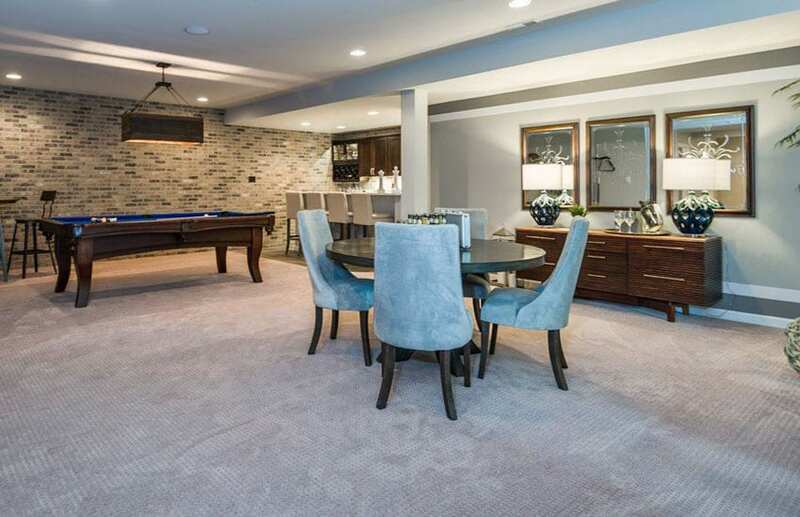 This multi- purpose room and entertainment area, features a pool table, game table and home bar transforming a boring basement into the family room where everyone can relax, unwind and enjoy. Many finished basement ideas incorporate a home bar, game area and dining table to provide plenty of opportunities for entertainment and fun. 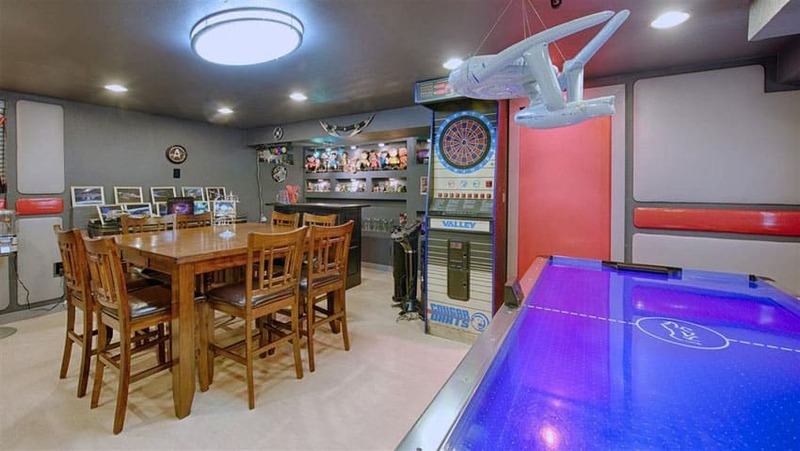 This “fun-tastic” gray basement recreation and game room features an air hockey game table, a display wall of toy collection and a Star Trek memorabilia and décor. Custom furniture, mini bar and other classic arcade game creates a perfect place for kids and kids at heart to unwind and have a good time. 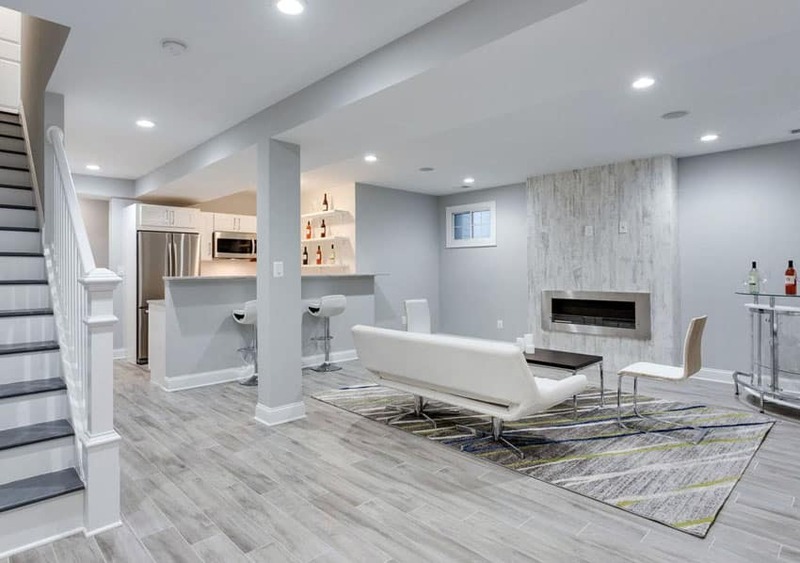 This contemporary theme gray basement with living room area features elegant furniture and a shuffleboard table is a Game & Entertainment Lovers Dream. Cool neutral colors with splashes of vibrant warm colors gives this room a groovy, fun, warm and welcoming ambiance. Perfect hangout spot for teens and adults alike. This traditional home basement is redesigned to be an adult’s retreat spot. 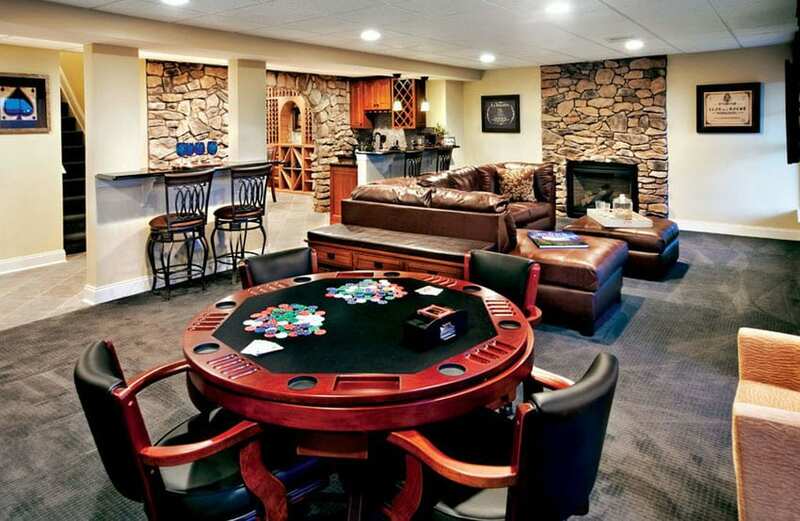 The game area features a poker table with black leather chairs, the sectional sofa and ottoman by the fire place are made of brown leather and a small counter with bar stools. 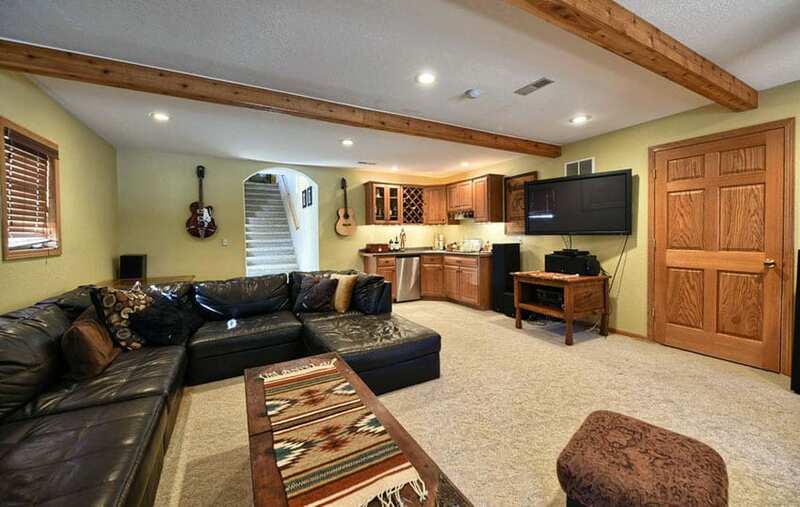 This entertainment area opens and flows out to the basement’s wine cellar. Decorative stones which are used for accent walls, arch ways and fireplace adds warmth and coziness to the room. Homeowners could entertain many friends in a fun place like this one. A basement retreat where you can watch the NFL big play in this large screen TV and relax on this comfortable sofa lounge. The shag carpet helps reduce the noise and sound from this small basement hideaway. The neutral color scheme for the ceiling, walls, floors and furniture adds warmth and coziness to the room. This carpeted finished basement game room offers two ping pong tables with a corner wet bar with storage cabinets. A large couch provides a place to hang out and watch sports games or movies. Boys will be boys. 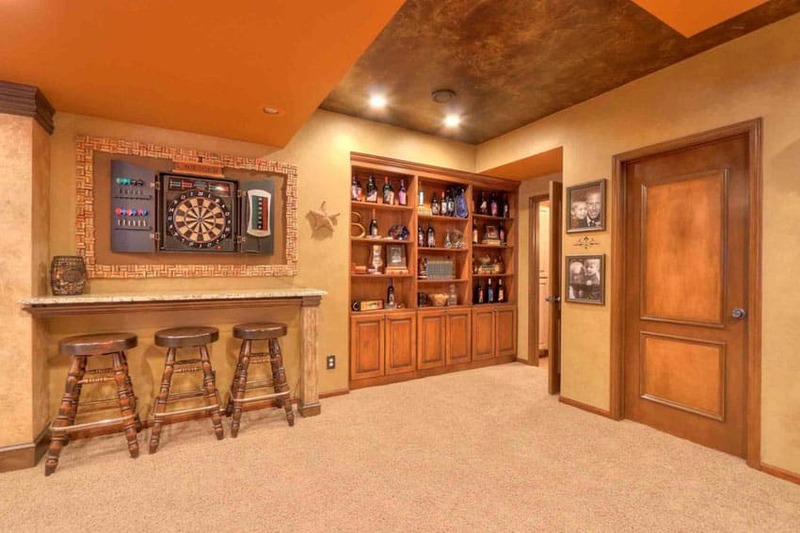 This small man-cave basement is fully equipped with the essentials a man would need in his hideaway retreat – a wall dartboard, a bar and a liquor cabinet. Texture painted ceiling in two tone colors and neutral color painted walls are balanced by the medium tone wood stain finish of the cabinetry, doors and bar stools. Wall to wall carpet adds a warmth and welcoming feel to the room. 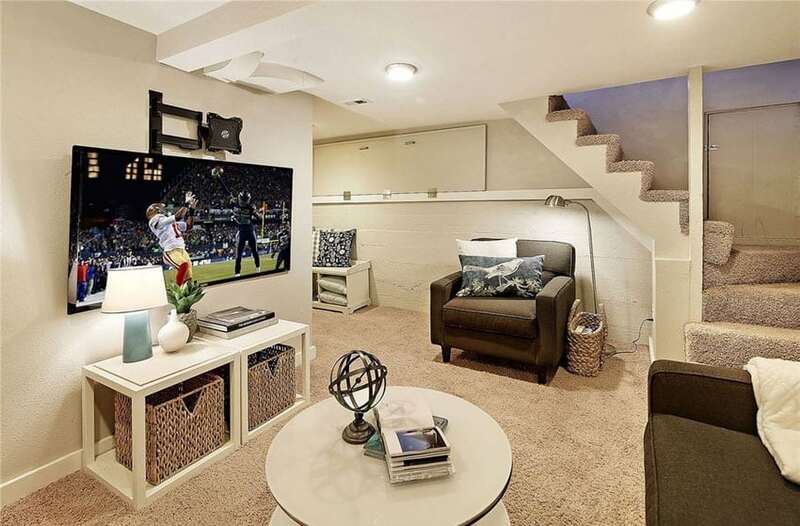 This fun and sophisticated football and baseball inspired sports room basement, features leather seats and sleek modern furniture is a perfect place for family members and friends to gather and watch Sunday night football. The display shelves of sports memorabilia draw attention to a collection of all those valuable and unique sports souvenirs. 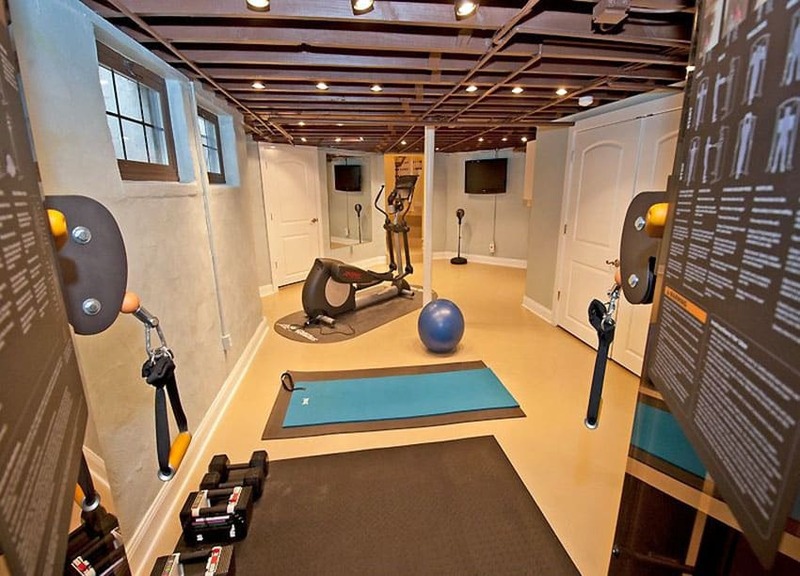 This basement combined with a home workout gym is designed to keep you fit while having fun. 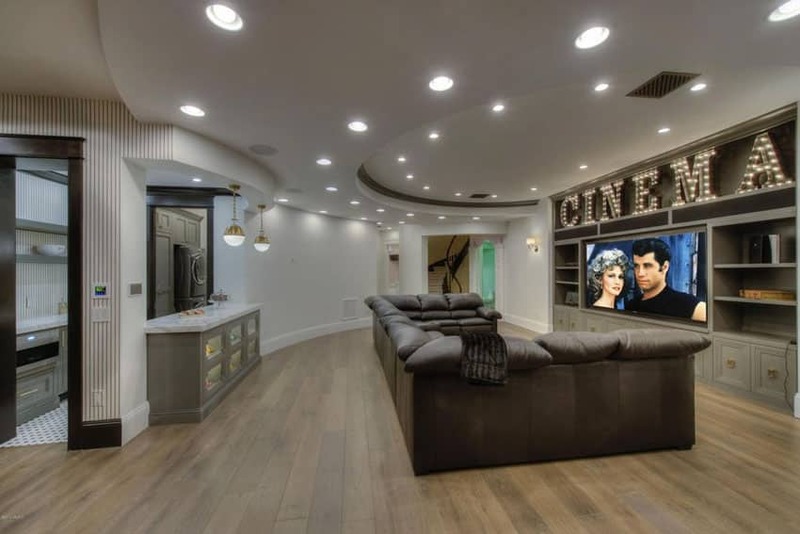 A luxurious contemporary basement opens to the movie and media room which showcases a drop round tray ceiling, recessed lights, light tone wood flooring and built-in entertainment center which stretches across one wall and doubles as bookshelves, provides extra storage for games, videos and other entertainment technology. A small pantry area provides convenience for food preparation and storage. Classic neutral colors add a sense of well-being, ease and coziness to the room. This sophisticated movie and media room proves to be a modern hangout for family and friends. Sleek, wall to wall open shelves cabinetry provides an elegant space for displaying keepsakes and a place for the projector screen, stereo, DVD player and other media equipment. Dark walls, comfortable leather movie seats are great for a movie night. 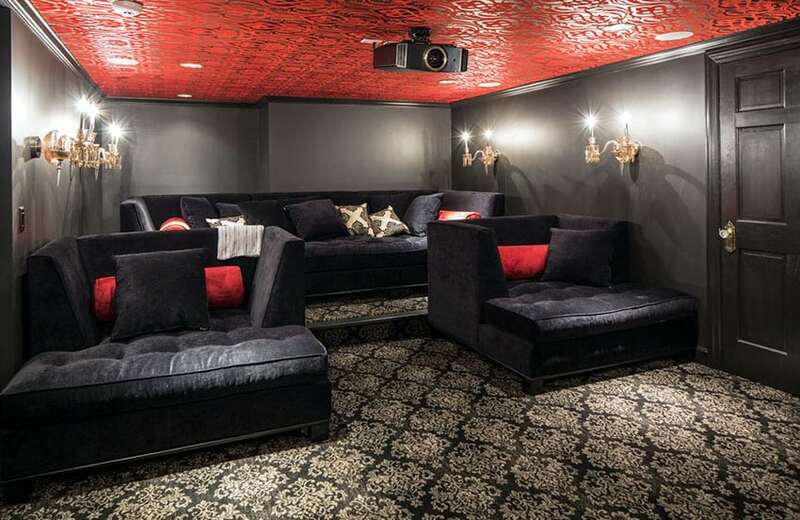 This plush basement home theater features a comfortable and stylish lounge seats, classic wall lights, black patterned carpet flooring, dark gray walls and patterned red ceiling; where guests’ movie room experience is elegantly superb. Home theater ideas such as this can be the perfect way to utilize a basement to transform it to a room the entire family can enjoy. Cool and cozy contemporary basement feature an oversized modular sectional sofa seat is a perfect spot to cuddle and relax or host a sleep over party. Drum pendant lights adds style to this small, snug living space. 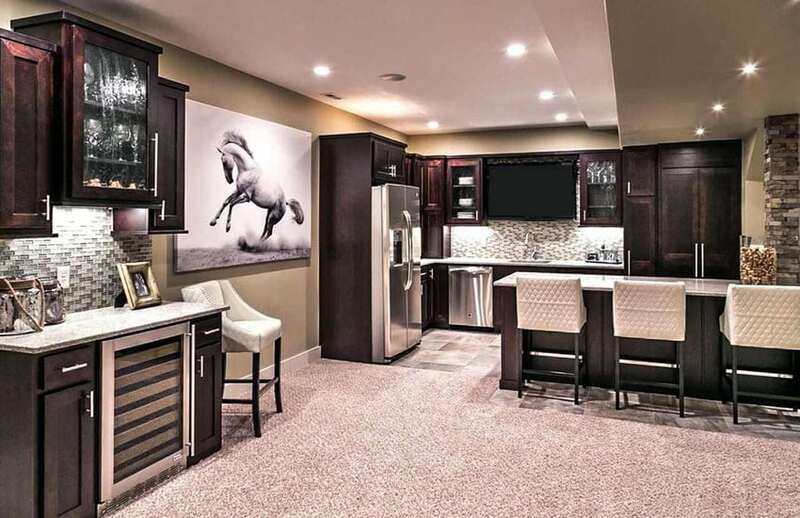 This man cave basement transformation features a wet bar with bar stools where snacks and drinks can be served while enjoying shows on multiple TV screens. Perfect place to host a Super Bowl Party! Open shelves and cabinetry with granite countertop provides more storage and preparation area. Adjacent sitting lounge is a great place to relax and catch up with the latest happenings with family and friends. Check out this page for more man cave ideas for the home. 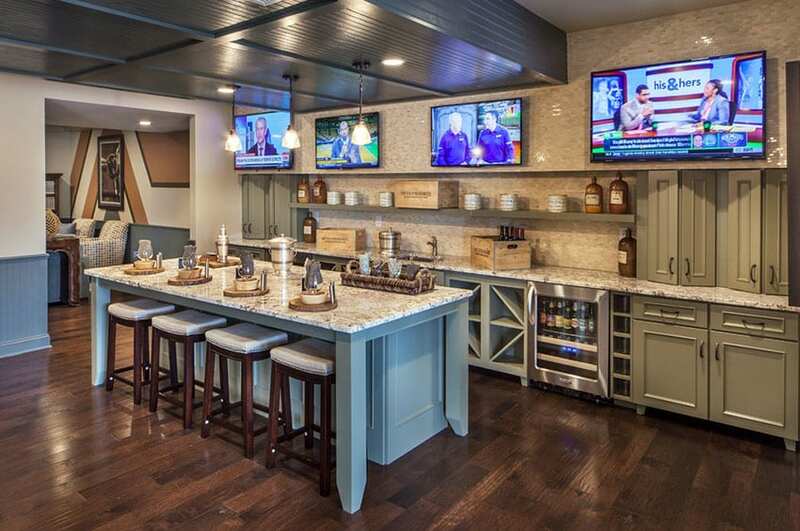 This custom basement home bar design features a small kitchen for convenience in preparing food along with other appliances, sink and wine fridge – perfect for entertaining family guests. Dark tone cabinetry in Shaker style is balanced with the matchstick glass backsplash and light neutral shade of walls, stone tile flooring and carpet. This beautiful luxurious wine cellar basement with dining table is a haven for wine lover homeowners and their guest to enjoy and unwind. This wine cellar innovation is an efficient and proper way to store and keep vintage wine collection. Traditional custom made cabinetry with natural wood finish is the best choice for this wine cellar; it is designed to prevent airborne contaminants to spoil those vintage wines. The coffered ceiling with recessed lights, crystal chandelier and patterned flooring complete the traditional rustic style. This contemporary custom home bar basement features a seating lounge, a custom built mid-sized wine cellar and a dining space which doubles as tasting area. 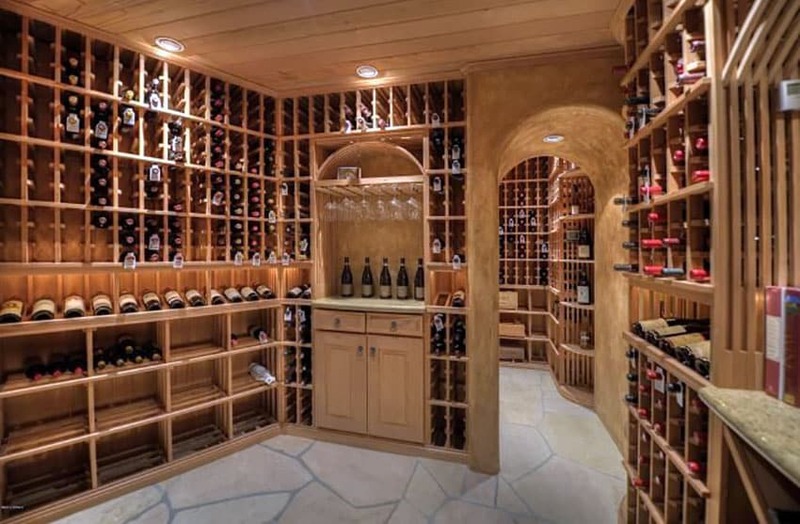 This wine cellar is built perfectly and efficiently not having direct sunlight. Its glass swing-out doors help maintain the correct temperature needed for wines to age and reach perfection. Wine requires proper storage, and transforming basements into wine cellar is putting this extra living space of your house in to good use. Choose wood which are good in quality having resistance to rot and decay, durable and requires only a mineral oil finish; such as redwood, mahogany, walnut or cypress. Stone floors are the excellent flooring system you can install for your basement wine cellars because they are strong and durable. Granite countertop is a good combination as well. Create a restful retreat with a cottage inspired basement with a built-in wood bench and a cozy bed nook. Cool neutral color scheme of tan, pale blue, cream and white combined with minimal furnishings gives this area a warm and welcoming ambiance. 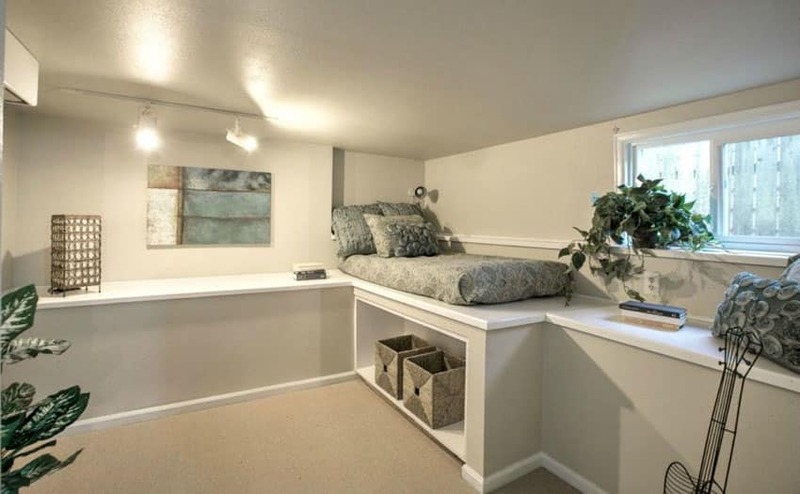 For small finished bedroom ideas a built in bench that can be converted in to a bed with under cabinet storage is a great space saver and can increase the home’s value. Create your own sports and hobby museum is the coolest thing to do with a basement. 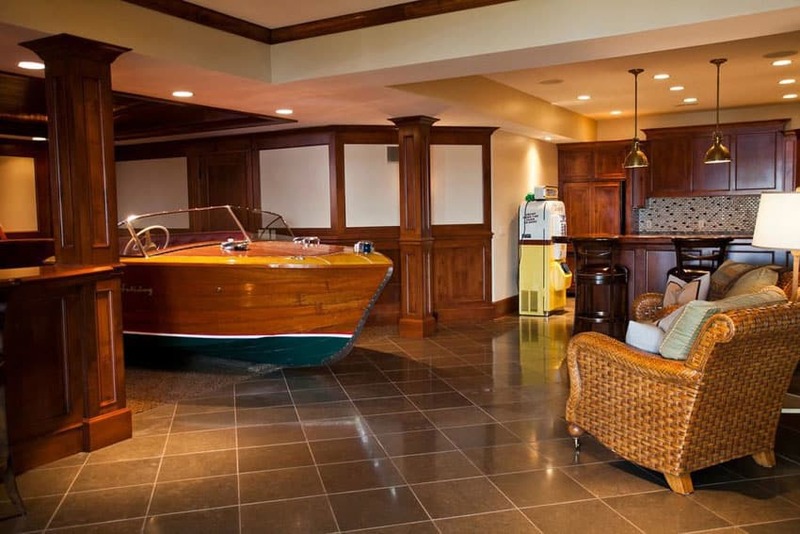 This eclectic basement is furnished with an antique wood boat which is showcased as the main focal point of this basement. A home bar and seating lounge are perfect addition of functional space which make entertaining more fun. Finished basement made use of existing materials and transformed it into an elegant basement living room. Painted concrete floors and concrete hollow blocks walls are painted in classic white and cool gray. Exposed beams are furnished with industrial lights which provide ample lights to the room. Comfy, soft upholstered sofas and accent chair in neutral colors adds coziness, perfect place to sit back and relax. Splash of patterns and colors from the area rug, accent chair and throw pillows gives a warm and welcoming ambiance. A traditional living room basement with a cool shade of lime color is perfect balance for the neutral shades of brown for the carpet, kitchen cabinetry, exposed beams, window treatment, door and other wooden furniture. The kitchenette is without an island. 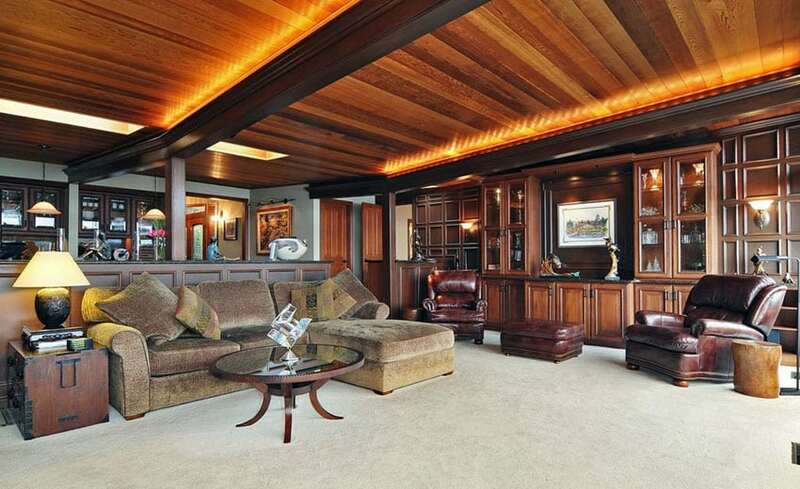 But has a corner home bar to give way to the large black leather sectional sofa which is perfect for movie night fun. 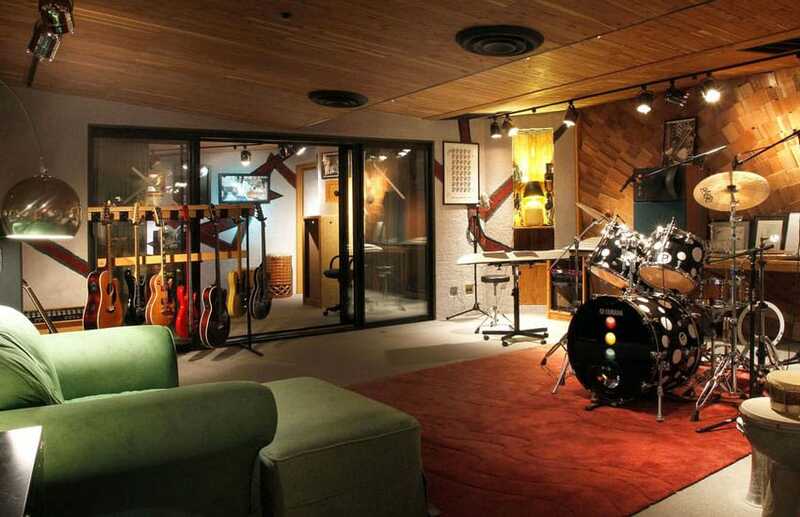 This practice basement room is haven for the music lovers, a retreat to express yourself through music and perfect place for a much-needed privacy and band practice. Complete with drum set, keyboard and a collection of different types of guitars, are instruments which make it possible for beautiful songs to be composed and played to the musician’s heart content. This lovely, feminine and elegant basement with living room is a tranquil retreat for the women of the house. Large, soft and comfortable sectional couch with round coffee table is perfect for those ladies’ get-together parties. 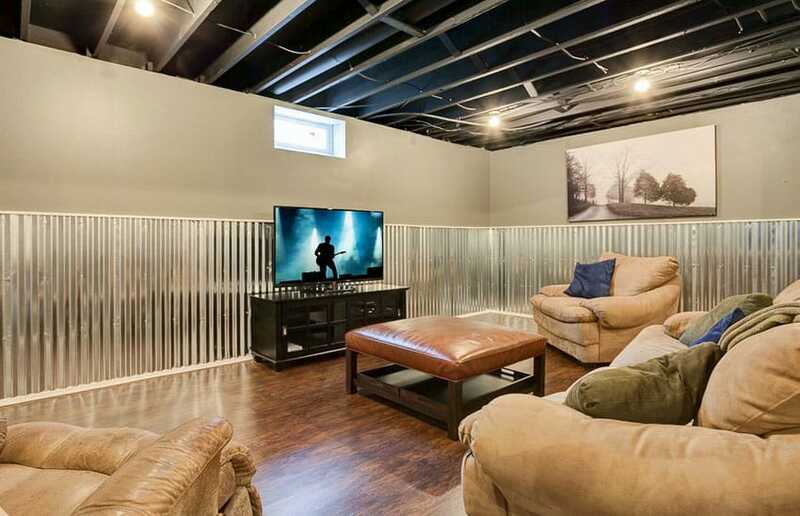 This classic transitional lounge basement which doubles as a movie hub features corrugated steel wall paneling and exposed ceiling giving this basement its rustic appeal. The fully upholstered sofa and arm chairs are so comfortable, it gives balance to the feel of steel. 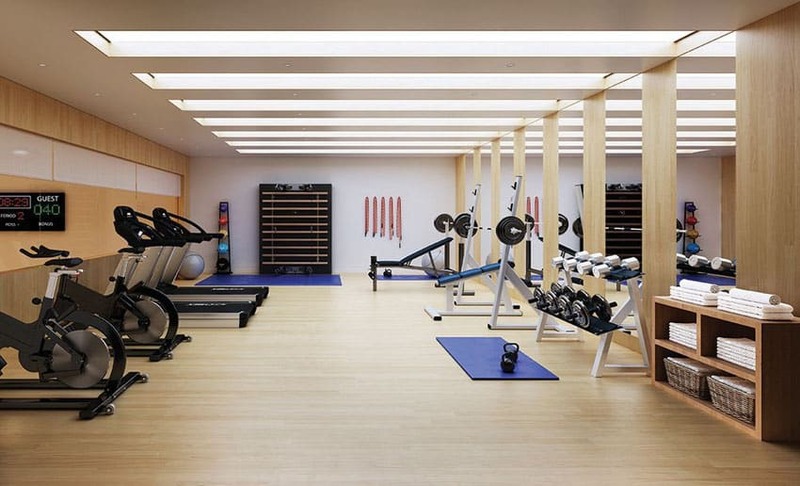 This luxury home gym basement is perfect for the whole family’s fitness hub. This is a great idea to make the best use of that extra space and keep in tip-top shape at the same time. A fully equip workout area features a weight bench, treadmill, exercise bikes and other fitness accessories makes it very convenient way to lose those unwanted weights in the comfort of your home. Working out from the convenience of your home is not impossible to be achieved. Did you know that home exercise equipment is smaller than its commercial fitness center counterpart? So, these equipment takes up less space in this multi-use basement home gym, which doubles as a yoga studio. Exposed beams with track light gives this room an industrial inspired theme. This luxury sauna and marble shower is a stunning add on to your home basement transformation. After a stressful day at the office or for a relaxing private retreat, this is a perfect place to unwind and help loosen up those tired and aching muscles. 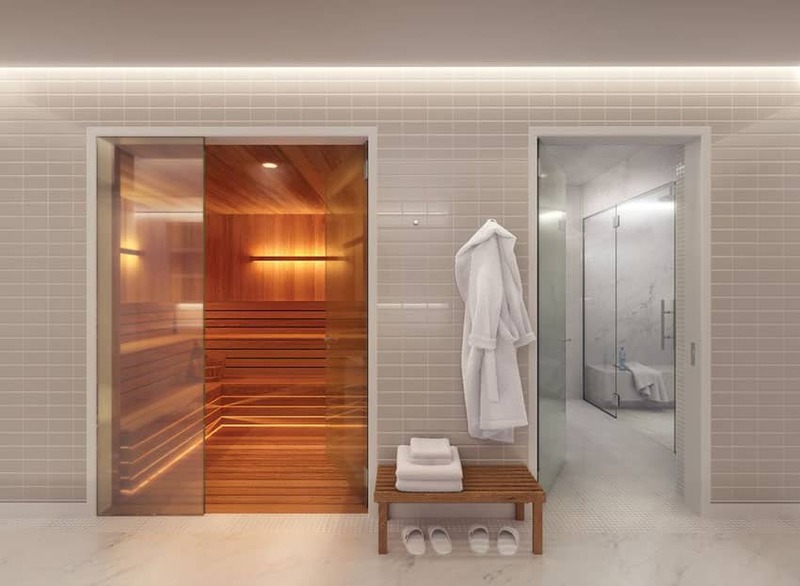 This sophisticated steam room sauna and walk-in shower which feature custom wood treatment, marble and tile walls will automatically increase the value of your home and property. 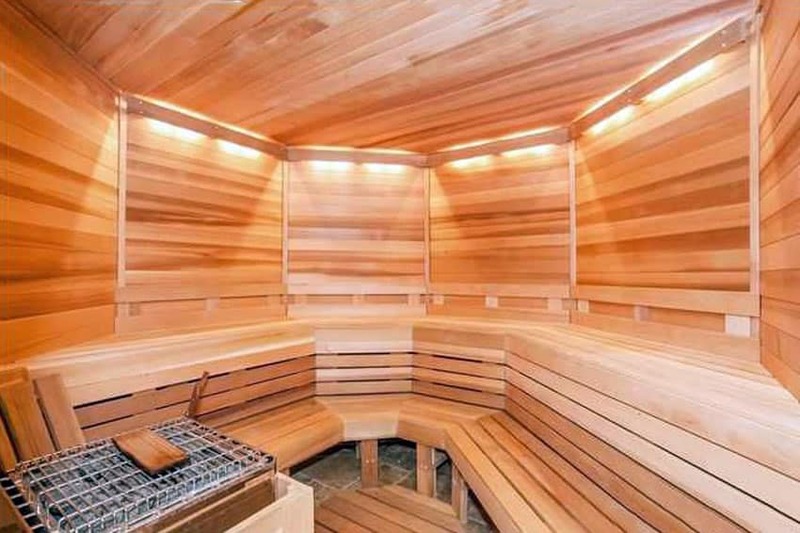 This custom-made basement wood sauna brings recreation and relaxation to a new level. A great new way to spend leisure time entertaining friends and have fun. An innovative and healthy way to relax and unwind in the comforts of your home. 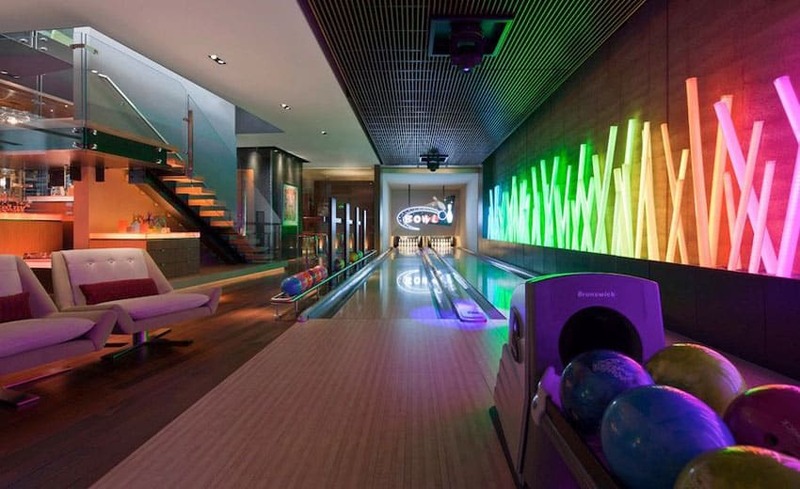 A luxurious modern basement home features a custom bowling alley room with two regulation size lanes, automatic Brunswick pinsetter machines, automatic lane cleaning/conditioning machine, secondary ball return storage rack, projection screen at the end of the lanes, medium tone wood plank flooring, wooden transition strip is incorporated onto the flush-mounted lane surface, different colored neon lights are installed on the walls adding a more modern accent , a mini bar and state of the arts swivel chairs. Featuring a stripped indoor tepee, neutral colored accent wall filled with memorabilia combined with a wood textured wall finish, another accent wall with wall paper depicting a night sky full of stars, wall to wall carpet, cozy couch and geometric patterns for the throw pillow. 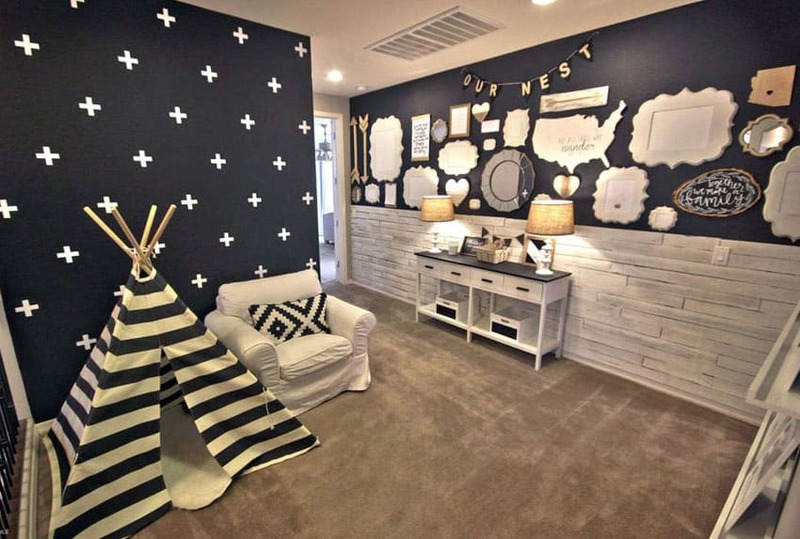 This basement playroom with a specialized native American Indian theme is what this black and white lovely kid’s playroom is all about. 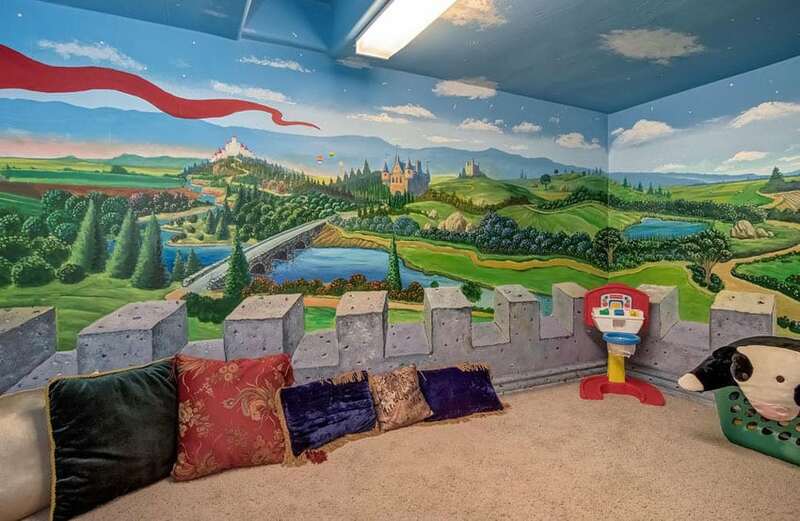 A whimsical castle inspired playroom features a mural painted walls and ceiling showing the entire kingdom. This “tower” can also function as a reading nook by installing carpet flooring, adding some throw and floor pillows which creates a perfect reading spot and a fun place to play, imagine, get creative and just “enjoy the view”. 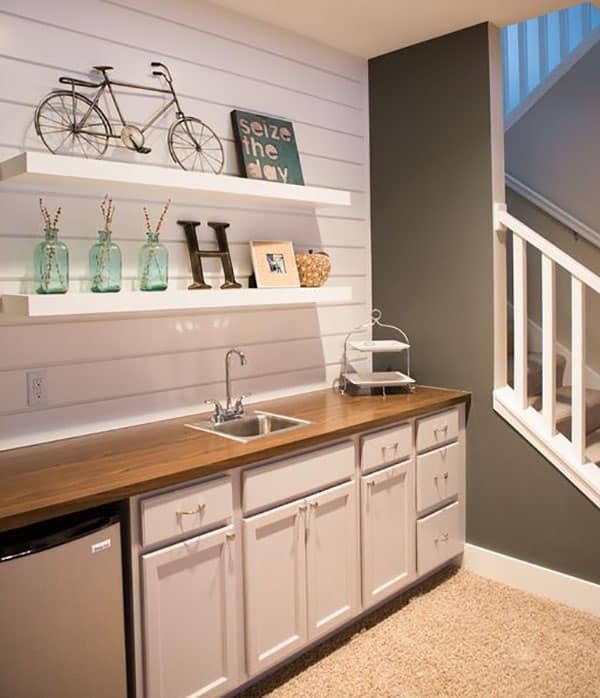 “Seize the Day” with this small basement makeover which feature a kitchen with shiplap wood cabinetry, butcher block countertop, white paneled wall, overhead open shelving, carpet flooring and a neutral color scheme. Don’t be afraid to use the Force. 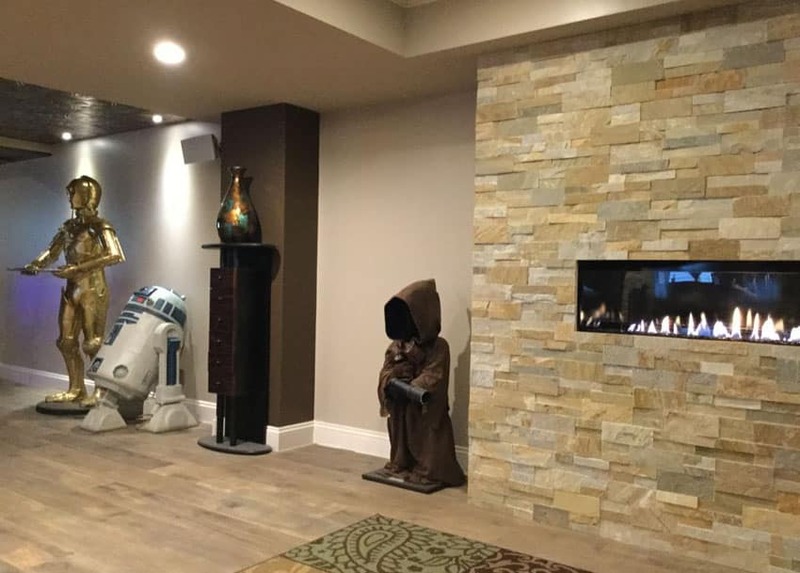 Inspired by the timeless Star Wars movie, this basement room features memorabilia of the Star Wars characters in the movie. This elegant scheme of beige walls, light tone hardwood floors and a stone fireplace is a perfect fit for a movie fanatic with a trendy taste for design. 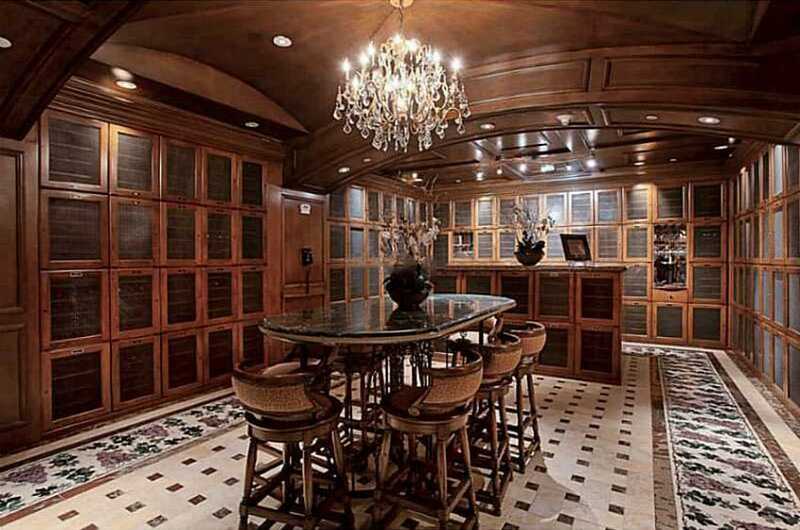 By using turf instead of carpet and a height of 3000mm, this game room basement features a full swing Golf Simulator, and a place with enough space to allow for swing practice. This trendy indoor sport is a good idea for a basement transformation for homeowners to entertain guests. 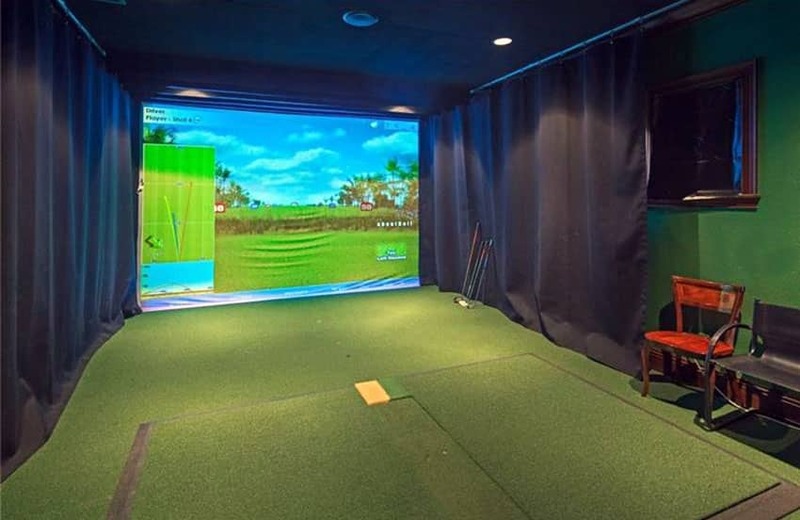 Indeed, this basement room with virtual golf practice driving range can be a man cave for golfers. Who wouldn’t stop and look at those wonderful fishes, as guests walk into this remodeled basement. 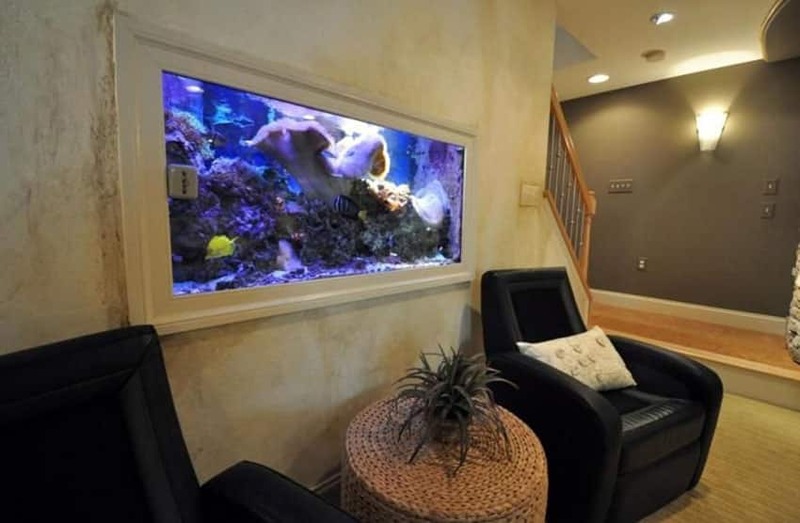 This huge wall aquarium adds a splash of color, depth and a trendy style to this basement. A seating area gives a warm and welcoming feeling. 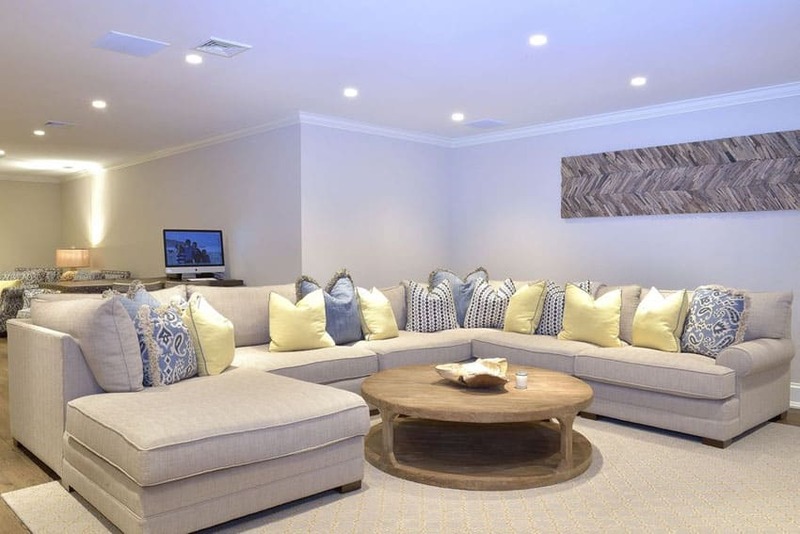 This contemporary basement media room features a living room with comfortable long brown leather couch with tufted ottoman; multiple TV screens are perfect when watching movies on a weekday evening or weekend, or watching your favorite sports live. Components and other things are tucked away in the custom-built cabinets below. 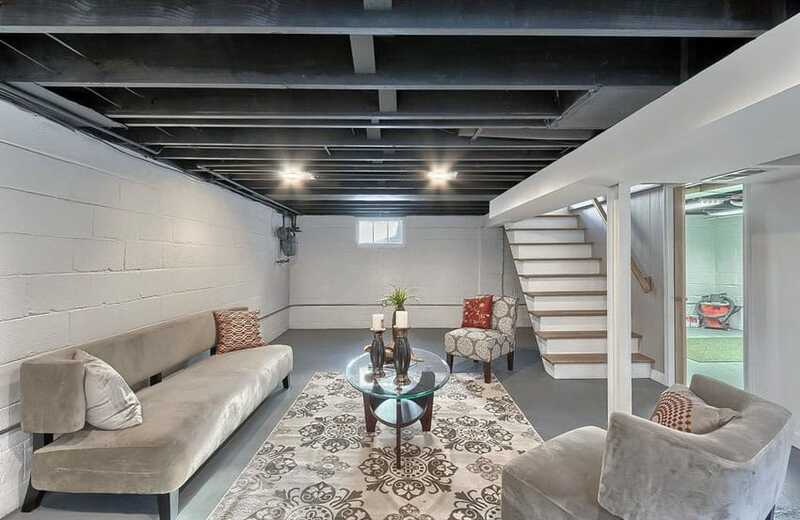 Neutral, monotone colors and layout scheme makes the basement hangout open and bright. 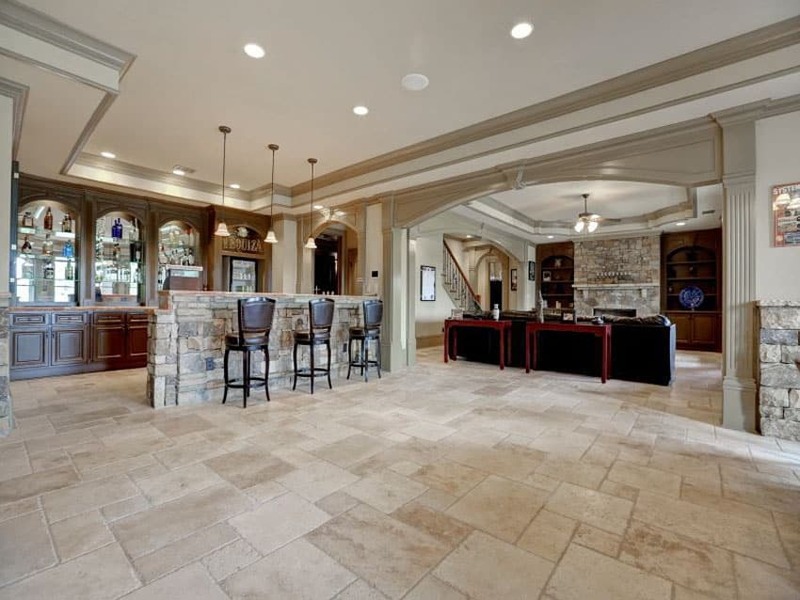 Elegantly designed finished basement which features an arched entry leading to the home bar is an inspiration for a timeless European style design. Light tone cabinetry provides more additional storage space. Granite countertop blends well with the whole color scheme. Neutral colored patterned ceramic tile flooring works well with the whole design scheme. A sophisticated media room featuring an open plan layout design scheme features a kitchenette and bar for entertaining, a light one wood cabinetry is designed for extra storage space and at the same time doubles as an entertainment area and a working/study corner. The fireplace serves as a focal piece and makes this room warm and cozy together with the cool neutral shades of brown and tan. 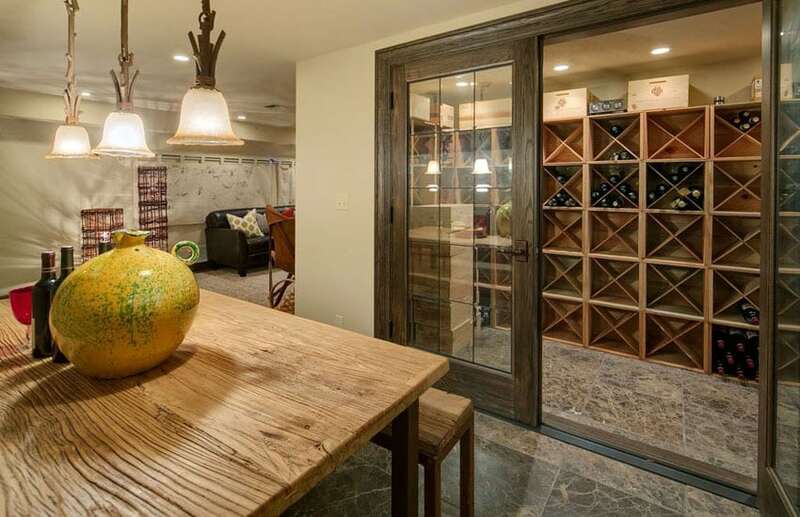 Creating a space that works, this rustic wood basement with a game table centered in front of the home bar for entertaining guests, friends and other family members. Stone flooring, wood wainscot panel and custom-built railings, cabinetry and bar counter in medium tone wood finish, carpet covered stairs and flooring provides a warm and welcoming feel. 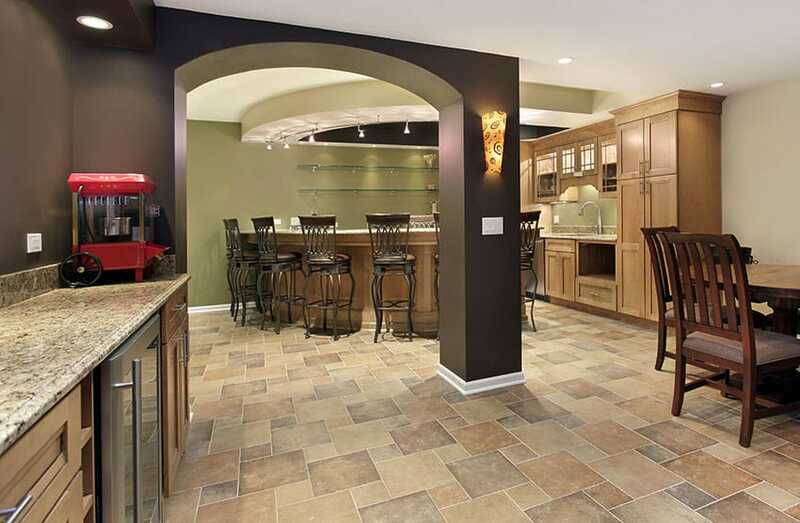 See more basement flooring ideas on this gallery page.